On a visit to a tiny school in a small mountain community in Colorado, a kindergartner is eager to let us know he got the message about the small mammals we study. “Pikas wiv undew gwound to get out of the sun and to keep fwom fweezing,” says Elias, the youngest member of the oldest continually operating school in Colorado. “Wow, my kindergartner is on fire with ideas!” exclaims teacher Natalie Littlefield. Elias attends Gold Hill Elementary School, a two-room schoolhouse built in 1890 and serving just two dozen K-5th grade students in a rural mountain community. The dirt road that squeezes past the school’s front steps is barely wider than my car. Except for cars, just about everything in this tiny town appears to date from the 1800s. As Education and Outreach Coordinator for the Niwot Ridge (NWT) LTER, this is exactly where I want to be doing outreach. Rural mountain communities represent some of the primary stewards and beneficiaries of the alpine and subalpine resources studied by NWT scientists. I want to help these schoolchildren understand they are stakeholders in NWT research. Although Gold Hill is just a few miles outside the high-tech enclave of Boulder, Colorado, the teachers here (there are two) seem overjoyed to have visitors from a university. The students are especially interested in my undergraduate research assistant, James Howe, Jr. He looks young for a 21-year-old, and they giggle when I introduce him as a scientist. Howe tries to use PowerPoint to show pictures from his summer research on the sub-surface microclimates experienced by pikas in the Niwot Ridge Biosphere Reserve. It takes longer than usual to get the technology to work in this old classroom, so he fills time by showing the students his props, including a tiny data logger that records temperatures all year. 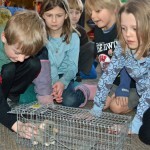 The K-2nd grade students in this class are more interested in the trap that Howe helps them set and trip, pretending to catch a stuffed pika. 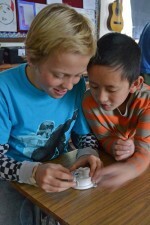 The data logger gets more attention a few days later, when Megan Wiebe visits the 3rd-5th grade class at Gold Hill to share her experience in the NWT REU (Research Experience for Undergraduates) program. Wiebe shows graphs demonstrating how pikas respond to variation in daily temperature. The students respond with so many questions that their teacher, Christine McCaul, has to cut them short with a promise to invite us back next year. A month later, NWT REU student Taylor Stratton enters a temporary school set up for students displaced by last September’s flooding in Jamestown, Colorado. 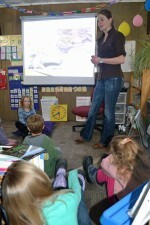 Stratton planned a half-hour presentation, but the staff in this one-room, K-5 schoolhouse invites her to stay overtime as the students eagerly ask questions and revel in “pika tag”. Stratton’s tag game demonstrates tradeoffs inherent in an alpine mammal’s lifestyle, as pikas (students) living in more favorable microclimates are more likely to escape winter cold, summer heat, and weasels (other students). During every presentation, I notice that the schoolchildren engage strongly with these undergraduate researchers. Maybe it’s easy for a child to imagine becoming a scientist when the scientist looks so young. Maybe the undergraduates are still contagious in their excitement for research. Or maybe it’s just that pikas are so cute. In any case, NWT now has plans to bring undergraduate pika research to other mountain schools as well as classrooms throughout the Boulder Valley School District.